Bless Your Heart (otherwise know in the South as “you poor stupid thang”). Now in the South when we say that, it can mean a myriad of things. If one is trying to be sarcastic … they’re telling you that you are being stupid. If one is replying to your circumstances … they’re probably still telling you you’re being stupid. Basically they are telling you to focus … you’re blessed and you don’t know it! You are concentrating on circumstances. Of course telling someone to focus on the good in their life will cause them to call you a Pollyanna … but, that is okay, there are worse things to be called. Are you blessed and don’t know it? More likely you are blessed and you are too busy focusing on the ‘wrongs’ to see all that is RIGHT in you life. COUNT your blessings, LITERALLY … out loud if you have to …WRITE them down … name them ONE BY ONE <~ click (George Beverly Shaw is 102 and still counting his blessings). Play “I Spy God” with your family. It is fun and rewarding … and you cannot play it without realizing all God has done for you. It will make you focus on what counts in life. “Spy” God in creation, in circumstances … everywhere. Make yourself SEE how involved He really is in your life. Every day you are blessed but you are so busy you seldom see the blessings. You take ‘good days’ for granted and forget to thank Him for all He’s doing. Yet, the minute something goes wrong … “Where was God?” …. “Why God?” Did you ask Him where He was on your good day? Did you ask Him ‘why?’ on your good days? You are blessed … do you choose to believe and recognize your blessings? Above all, thank Him for your salvation, for if you are “Soul Safe” … saved … have eternal life in Heaven with Him, you are truly blessed, regardless of circumstances here on earth. 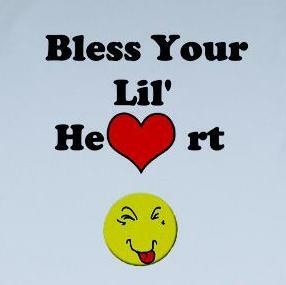 This entry was posted in COPYRIGHT:, Mom2Mom and tagged Beatitudes, Bless Your Heart, Blessings, children, Christian parenting, Circumstances, Count Your Blessings, Jesus, parenting, praise, Prayer, Soul Safe. Bookmark the permalink. ← You a Talker or a Walker? I love playing that game. It definitely is a great way to remind us all of how God is all around us and allows us to be thankful. I really enjoyed this post.